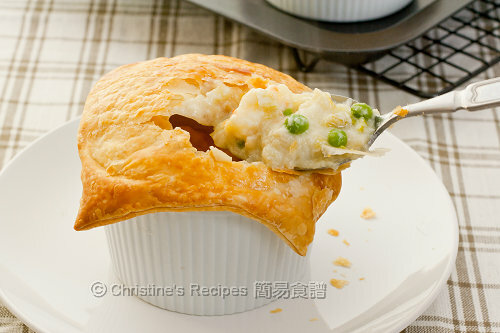 These fish and prawn pies were baked in ramekins. The fillings are creamy and juicy. Once the pies were out from the oven. Everyone in the family was so eager to dig in the flaky crust and find out what's inside their ramekin. It won’t be wrong if I serve a pie on our dining table. My daughter is so attracted by any bakery made of puff pastry. No matter what I put inside, any kind of meat or veggies, she will quickly dig into it and taste the delicious fillings going with the fluffy pastry. Baking a pie with store-bought puff pastry is a piece of cake. All I have to do is to get the fillings ready, covered with puff pastry and pop it into the oven. The only thing I would worry is that if they aren’t aware of the fillings is steamy hot inside, they would be in trouble. Remember to slowly dig in. Rinse leek and wipe dry. Finely chop. Set aside. Rinse fish fillet and wipe dry with kitchen papers. Cut into chunks. Peel and devein prawns. Cut each into 3 pieces. Set aside. Heat oil in a large pot or wok. Add butter. When the butter melts and turns foamy, add the leek, shallot, bay leaves and cook until aromatic. Stir occasionally and cook until the leek softened, about 4 to 5 minutes. Sprinkle flour and stir to combine well. 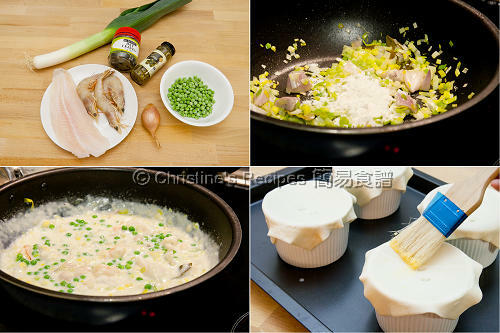 Cook for another 2 to 3 minutes. Slowly pour milk and stir until nice and smooth. Cook for about 5 minutes. Stir in fish and prawns. Cook for 3 minutes. Add capers. Season with salt and pepper. Remove from heat. Let it cook for a while. 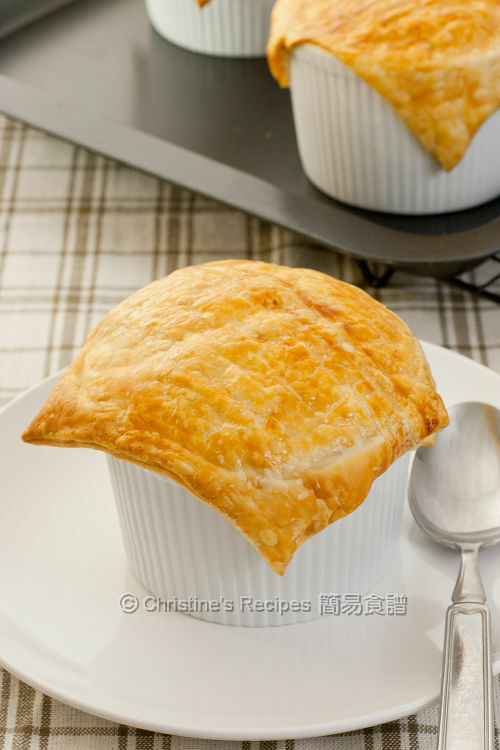 Place puff pastry at room temperature until just thawed and workable. Cut into 4 equal portions. Divide the fillings into individual ramekins. Cover each with puff pastry portion. Lightly press the edges. Use a sharp knife to cut 2 slits in the middle to let the steam escape. Brush with whisked egg. Transfer to preheated oven. Bake for 10 to 12 minutes, or until lightly brown. Reduce heat to 180C / 356F. Continue to bake for another 25 to 30 minutes, or until pastry is golden brown. Enjoy! Capers are tiny pickled flower buds, with salty and tangy taste that helps to add more flavour to this dish. They are available at supermarkets. If using frozen fish and prawns, let them rest in room temperature until thawed completely. Wipe dry thoroughly. Otherwise they will release water while cooking and loosen the sauce. The consistency of filling should be quite thick. When baking, fan-forced mode is preferable if your oven has this function. It helps the pastry turn golden brown color evenly. Wish there is a recipe for the puff pastry. Quite lazy to make puff pastry from scratch, heehee. Hi Christine, I just wanted to say that I really really love your recipes. I can only do western style cakes but my husband and I really miss the flavour of traditional Asian cooking (he gets sick of the fusion teriyaki soy sauce stuff I cook) and your recipes honestly reminds me of all the food my late mother used to make at home. Thanks so much for bringing it back and keeping the traditions of HK style cooking alive! If you get a chance, feel free to check out my cakes (https://www.facebook.com/SugaConceptz) but believe it or not my #1 dessert is still egg tart (especially the one from Tai Cheung in HK). Hopefully I can make it taste somewhat similar with your recipe! Glad that you loved my recipes. I grew up with all these HK style cooking. They are very unique and tasty. Browsed your facebook page and amazed by your gorgeous cakes. I too enjoy a comfort dish like this..looks beautiful! Love it :) .yummy.. Have always enjoyed reading your blog. Thanks for your encouraging words Ade. I love your recipies. Very impressed with how you've managed to cut your puff squares so beautifully. Do you cut it whilst its still semi-frozen? I'm always tearing mine when I lift it over my pie dish :( Thanks for sharing. For cutting puff pastry, I don't wait until the frozen puff pastry thawed totally. It'll be too soft and difficult to handle. Just wait until it's not too hard, it'll crack otherwise, but barely soft and easy to cut. That looks so good (minus the peas)! Thanks Christine, love all your recipe. 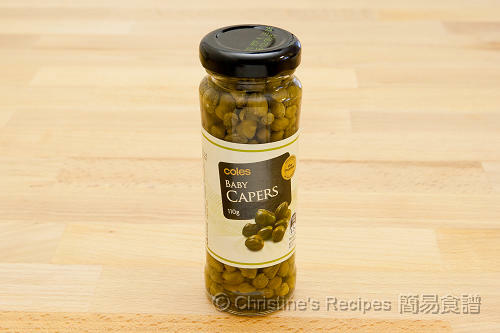 For this, is there a replacement for capers? Capers are to add more flavours. If you don't have any, simply skip them.